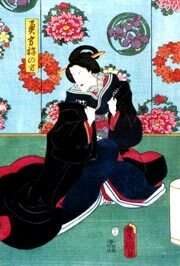 The play "Shin Usuyuki Monogatari" was originally written for the puppet theater (Bunraku) and staged for the first time in the 5th lunar month of 1741 in Ôsaka at the Takemotoza. It was adapted for Kabuki a few months later and staged for the first time in the 8th lunar month of 1741 in Kyôto at Hayagumo Chôdayû's theater, produced by Sakakiyama Jûtarô I [casting]. The "Sannin Warai" scene was performed for the first time with the actors Sakakiyama Shirotarô I, Arashi Koroku I and Tamiya Shirogorô in the roles of Saisaki Iga-no-Kami, Ume-no-Kata and Sonobe Hyôe. "Shin Usuyuki Monogatari" was originally a 3-part drama. The current version is now made up of 4 acts (divided into 7 scenes). "Sannin Warai", the scene of the three laughs, is the nickname of the third act ("Sonobe Yashiki"/"at the Mansion of Sonobe Hyôe"), which is made up of two scenes. It is also called "Aibara". The tale's train of tragic events is set off when Saisaki Iga-no-Kami's beautiful daughter, Princess Usuyuki, falls in love with Sonobe Hyôe's handsome son, Saemon. But the two young people soon fall foul of an evil scheme hatched by Akizuki Daizen, who bears a grudge against Saemon and his father Hyôe. Saemon and Usuyuki are suspected of treason against the Shogunate. 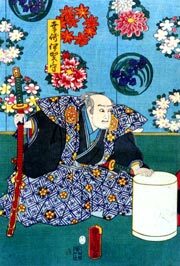 The shogun's messenger, Katsuragi Minbu, decides to let the two fathers interrogate their children by placing Saemon in the custody of Usuyuki's father, Iga-no-Kami and Usuyuki in the hands of Hyôe. After a month of care in Saemon's home, Usuyuki is urged to flee for her own safety. After her departure, a messenger arrives and announces that Saemon has been beheaded after confessing his crime and that Iga-no-Kami will bring his head shortly. Iga-no-Kami asks that Hyôe behead Usuyuki using the sword sent with the messenger. The play culminates with Iga-no-Kami's entrance along the hanamichi passageway, carrying a wooden casket supposedly holding Saemon's head. He walks falteringly, for he has already stabbed himself in the stomach. He sits down with Saemon's mother, but she refuses even to greet him. Hyôe then emerges from the back room holding a wooden casket supposedly containing Usuyuki's head. 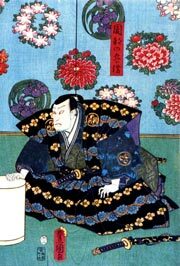 When Iga-no-Kami and Hyôe each open the lid of the other man's casket, they find only petitions to the authorities. The two fathers have committed seppuku behind the scenes to spare the life of the child in their custody. In a memorable finale, the two men laugh together despite their intense pain.